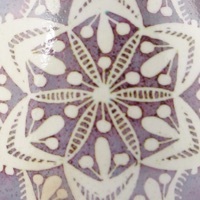 What’s new on the pysanka site? Since I’m always tinkering with the site, and often adding new items, I thought it might be useful to have a page that tells what’s new. The items are listed below, beginning with the most recent. 20 March 2019. I’ve added annual collection for 2017; 2018 is photographed and awaiting placement and identification. And I’ve been updating many sections and pages....too numerous to list individually, but the Teaching pysankarstvo section has has had a lot of updating, along with Pokuttia and Cherkashchyna. Symbolism is progressing, but not quite done yet. And the Index hasn’t kept up! Have a wander around the site and enjoy. 9 February 2017. Although I haven’t updated this page in a very long time, I have been working on the site intermittently. There are lots of new goose eggs to look at here. I’ve added several years’ worth of snowflake pysanky here, and have been rewriting the Symbolism section......it’s almost done. 9 October 2013. Autumn is here, and it’s time to work on the site again. I have expanded the glossary, although it is nowhere near complete yet. If you have suggestions for words or terms that should be included, e-mail me. Have a look. 17 Jun 2013. Our exhibit at the Detroit Historical Museum has finished its run. 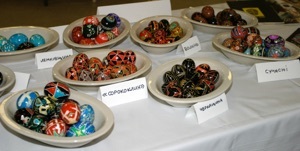 The exhibit was about the Ukrainian Immigrant experience, and showcased 1300 pysanky, mostly traditional. About 70% of the pysanky were mine. In the process of putting together this exhibit, I finally photographed all of my traditional pysanky Now I need to begin editing the photos so I can post them on this web site. 27 February 2013. I’ve spent much of the past year migrating and updating my site, and trying to fix errors which have popped up. If you find any that I’ve missed, please let me know. I am in the process of creating a glossary for this site, and have put a few dozen terms into it. I’ll add more as I think of them. If you have suggestions, e-mail me. 30 November 2012. 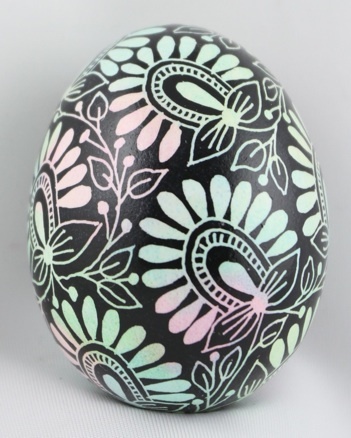 I’ve uploaded some photos of faux sgraffito eggs to my site. You can see them here. I am creating a new section on the technique, but it’s still a work in progress. And don’t be a stranger! Come visit! I’ve also been re-writing some of them. Have a look at the Finishing section , for example. As always, more to follow. 31 December, 2011. I received some bad news las summer–Apple would no longer be hosting web sites through MobileMe. As they have been hosting my website for many years now, in several iterations, this was a blow..and a challenge. They were kind enough to warn me, though, and give me a full year of free service, while I made the transition to a new web host. 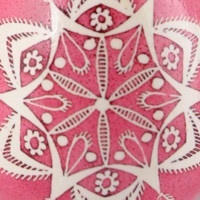 Although I have been adding bits of new information and new photos to the site, I have been mostly transferring its contents to a new address: http://www.pysanky.info. I have owned this address for several years now, but have been using it as a shortcut redirect. Now it will be the permanent address. The MobileMe site will remain up at least through June of 2012. What will happen to it then I don’t know. It may disappear completely, or it may remain there, either whole or in some mutilated fashion (as my old Homepage site remains, text only, no photos, and not changeable or deleteable by me). I have spent the past few months slowly uploading content to this site. In the process of doing so, I have been improving pages and adding material. I have also spent many hours recreating pages that have gotten corrupted. Sigh. Eventually it will all be at the new site. 28 March, 2011. I have been updating various parts of this site sporadically, in-between jaunting off to Nicaragua and India, cleaning up after Christmas, and replacing the sump pump. I’ve finished sorting and editing the Bukovynian pysanky from Roztoky (the Ivan Balan collection), and have begun uploading them to my site. You can see what I’ve gotten done here. I decided to sort them by division (mostly) rather than in some other arbitrary manner. That inspired me to work a bit more on my Divisions section; I’ve finished two more divisions, the Equatorial and the Eight. Have a look. The rest of the rest will slowly follow. I should really get to working on this year’s pysanky; I began a dozen pysanky before I left for India; I’ve stocked up on eggs, including goose and duck, and am raring to go. Enough typing–time to write eggs! 29 December, 2010. It’s been a very busy fall and winter, with Christmas* on its way and the New Year just around the corner. My Christmas tree, which kept me very busy for several weeks, won an award from our local newspaper. I misplaced a lot of work I did on Bukovynian pysanky, and now I’ve come down with a cold which requires me to sit in front of the fireplace, huddled under a blanket, sip tea and not do much of anything active. 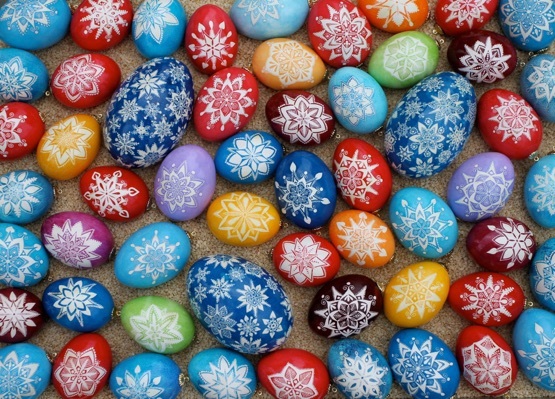 Working on the web site is pretty relaxing, so today I posted almost 4 dozen new snowflake pysanky to my site here. I also wrote up my “two-tone” technique for dyeing snowflakes, as illustrated in the photographic details below. 8 October, 2010. I’ve done a lot of work on the Wax Removal section, and have finished (I hope) with heat removal. (If I’ve left out your favorite method, or gotten anything wrong, write me and let me know.) I’m working on chemical dissolution now, which has meant reviewing some chemistry, and on residual wax and soot, which needs some photos as well as being written up. Have a look at what’s there and let me know what you think. 25 October 2010. While working on something else (methods of wax removal), I was distracted and ended up working on the Voropay pages instead. I’ve added a biography, tweaks and photos. Have a look. 12 October 2010. It’s autumn, and my thoughts turned to Halloween......and pumpkins. They’re everywhere in southern Michigan, as Jack-o-Lanterns are an integral part of the holiday here, and pumpkins are a cash crop in the exurbs where I reside.. I first made pumpkin “pysanky” in 2005; this year I not only made a bunch more, but decided to do a step-by-step pumpkin tutorial. 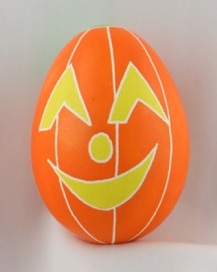 You can see photos and the tutorial in the new, improved Pumpkin Egg section. 25 September 2010. My small Western Digital external drive failed this morning, after I had just finished uploading Ivan Balan’s Hutsul pysanky and organizing them. Luckily, all the other updates I had done to the site last night had been published, and I’ve recreated them in my code. I am in the process of re-uploading the Hutsul pysanka photos. You can see the other Balan pysanky and decorative eggs here. I also added some pysanky by Pani Natalia Sokil from Chervonohrad here. I must add that I am NOT happy with WD, as I have owned some 6 small portable drives over the years and this is the only one to ever fail, and after only 2 months of use! UPDATE: Hutusl pysanky now on line here. It is the only page in that section with any content, though. For postcard enthusiasts, I’ve added a few more cards to my electronic collection. They are from Kolomyia, and either feature the pysanka museum, or were sold to me by the museum and feature pysanky from their collection. 29 August 2010. I finally uploaded my “Group Photos” of pysanky to the Screensavers page. These are photos I’ve been sending out on an annual basis to friends of mine; several have told me they use them as screensavers, so I have uploaded full-sized files to the Downloads section so you can to, if you want. I’ve also updated and added more information to the “Types” section, and have added it to the Index, along with the “Pysankiana” section. Both are still works in progress, but are complete enough now that they are worth my sharing and your perusing. 8 August 2010. I’m back from a great month spent in Ukraine, much of it involved with pysankarstvo, both teaching at camp and meeting with other pysankary. I have lots of new photos to post, new books to review, and stories to tell, but haven’t gotten to it yet. 16 June, 2010. Mostly tinkering, as the garden has been calling me a lot lately, with shouts of “Weeds! I’m full of weeds!” But I did take time out to redo the Finishing section of Pysankarstvo. There is some new information, and a lot or reorganizing and aesthetic improvements. I learned that I will be teaching pysanky again at summer camp this year, which will be held in Kolochava, Zakarpattya oblast. I assume we will be getting seventy students again this year, with some likely repeats. I’m hoping that I will be able to get my goddaughter, Daryna, to help me out, as last year’s assistant (and my scholarship student) is getting married this summer, and probably won’t make it to camp. 2 June, 2010. I was away in May, and didn’t do much with the blog or the site: I had limited web access and, after all, I was on vacation! Since I’ve been back I’ve been inspired to do two things with the site. First, I have revamped and re-organized the section on the folk pysanky of Volyn. You can have a look at it here. Second, I have created a custom Google Search engine for my site. I can’t get Google’s code to work properly when I try to embed in on my site, but this link will take you to and off-site version that works quite well. I’ve added links to it on most main sectional pages, and have a specific “search” page on my site. The Google search engine does have ads (getting an ad-free version costs more than I am willing to pay). Give it a go! 27 April, 2010. 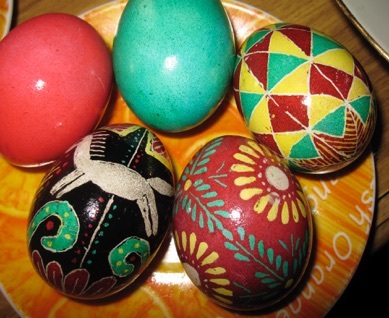 I’ve added a Pysanka Blog to this site......because I can. Well, actually, it’s because I finally got around to playing with the software and realized how easy it was to use, compared, to say...Blogger. It’s less clunky, Mac friendly, and no need to use html (which was necessary in the earlier days of Blogger). The blog is to share things I’ve learned or figured out, new ideas, new techniques and new information, before I formally incorporate it into my web site. It’s sort of a rough draft for the site. I’ll also be adding things I’ve posted to the Yahoo Eggs-Pysanky group, and things I learn there. Have a look here at the new blog. 15 April, 2010. And I have to been furiously filling out taxes today, but, rather, working in the yard in the 80 degree weather. I got some interesting images in an e-mail from a friend yesterday, and thought it might be time to update the “Pysankiana” section. Go have a look at the pysanka miscellany! 14 April, 2010. I’ve been tinkering with the site, now that taxes are finished and filed (Hurrah!!!!! ).I’ve updated the Supplies Links to include a bit more information about my friend Ulana’s new products at Wax Art Supply. Her father started the firm over thirty years ago, when he began selling the fist commercial electric styluses in North America (the “white-handled” ones). Ulana and her sister Christina have taken over the business from their dad, and have expanded their product line to include wax, dyes (their own mixes), kits and more. Have a look at their new, improved site sometimes. And my scholarship student in Ukraine, Tanya, who is graduating this year with a speech therapy degree, sent me photos of the pysanky she made for Easter. She learned how to write pysanky last summer at camp, when she helped me teach 70+ students, as well as volunteers and teachers, pysankarstvo. These are her eggs, along with a couple of krashanky. Tanya also announced the great news that she and her boyfriend are getting married this August. I am looking forward to the wedding, in Dnipropetrovsk. 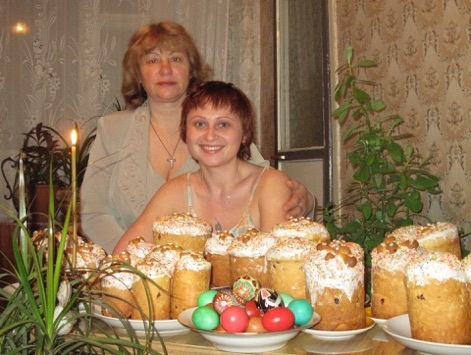 Here is Tanya with her future mother-in-law, and the paskas that they baked for Easter. 7 April, 2010. Easter is past, and now I have a bit of time to catch my breath and get caught up on the site. I’ve been too busy making pysanky to write much about them, or even to post anything to this site. I hope to make amends soon. I taught classes at our church and school, and had some six dozen eggs to varnish and drain (with a few minor repairs). I’m having my annual pysanka session tomorrow, with nieces and nephews and assorted cousins and friends of theirs galore. I’ll have photos of all these events, and of the eggs produced, soon. And I taught some young Australian friends of mine to make pysanky; their pysanky are here. I have been working on an updated section on Types of Decorated Ukrainian Eggs; it’s about 2/3 done, so I’m uploading it as a work in progress. Have a look here, and check back later for the other stuff. 25 December, 2009. Merry Christmas to all who celebrate it today. 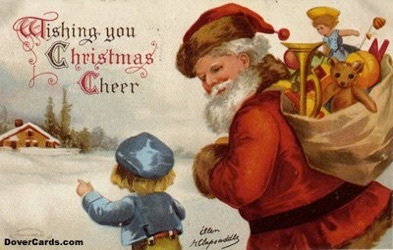 To me today is “Santa” Christmas, a day to gather with family and exchange gifts. In January will be the “real” Christmas, when we celebrate the old traditions: Svyat Vechir and Kolyada. 23 December, 2009. I love a roaring fire and Christmas songs on the stereo. A lovely Christmas tree glowing the in background makes it perfect. WIth all this inspiration, I’ve just about finished updating the snowflake pysanka section for 2009. I’ve photographed and uploaded all but the goose eggs; I’ll have a go at those tomorrow. 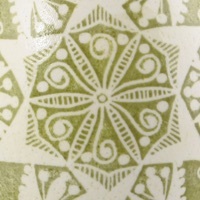 You can see the 2009 collection now in the Snowflake Galleries. 6 December, 2009. Lot of changes on the site. 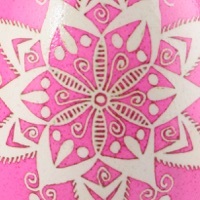 I’ve finished the Snowflake Pysanka Techniques section, and have begun uploading photos to the Bukovyna section. The rest is little corrections and fine tuning. I’ve also begun working on the Teaching Pysanka Classes section; it’s a work in progress, but you can have a poke around if you like. 10 November, 2009. More catching up. I’ve added a few more steps to the step-by-step snowflake pysanka. It seemed as though the last two steps were too complicated, so I’ve broken them up into a series of smaller steps. Look at the Applying Wax page in the Techniques section. I’ve finally edited the rest of my photos of the 2008 snowflake eggs; those are here. I will also add them in to the appropriate color and size categories. I’ve uploaded two Frog Eggs (chicken and goose), in case anyone else has friends or relatives with a frog fetish and is looking for designs or suggestions. And completing my additions to the non-traditional pysanka section, I’ve added some more autumn leaves pysanky, the ones I’ve made this year. 1 November 2009. Lots of new stuff on the site, but not all of it ready for prime time. Most important, and not at all pysanka related, my niece and nephew had their homecoming dance last weekend, and this proud aunt got to take photos. I have never in his 14+ years seen Nick in a suit, so it was quite a rare and exciting event. Photos are here. 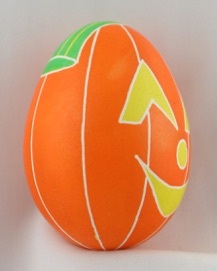 Pysanka-wise, I’ve begun uploading the Ivan Balan collection to this site. Ivan is a collector of Bukovynian pysanky, and allowed me to photograph his collection (less the 100 or so that are out on loan with a neighbor) this past August. I ended up with almost 2000 photos of 450+ eggs. Editing all those photos took a while, and some of them are up here, along with a biography of the collector, who is an artist of some renown. For those of you who like snowflake pysanky, I have some instructions, with step by step photos up here. I’ve added a new section on Wax Removal, which is still early in its gestation, and have been working on my new regional sections, Bukovyna and Kyivshchyna, which are not ready for viewing yet. 27 October 2009. I’ve been working on this site intermittently, with mostly fine tuning, buffing and correcting. I’ve also added new photos, particularly those of student pysanky from summer camps past. For some reason, webdings are not working, so all of my left and right arrows have turned into 3s and 4s. Opera still show the arrows, but none of the other browsers do. I’ve taken lots of photos, and edited even more of them, so those should go up soon. I’ll keep you posted. 1 October, 2009. I’ve been working on several sections of the site, and have added material to the Dyes section. I plan to reorganize it, so remember to use the Index if you can’t find something because your bookmarks no longer work. Last year I was trying to find a good Brown color for finishing pysanky. I’d had problems getting a nice, deep brown color; I had several reddish browns (Brick, Trypillian), and nice light browns, but nothing more solidly brown. My old standbys, the Surma and UGS dyes, were not adhering well and/or giving odd results. I mixed up batches of every brown dyes I had, and tested them out. You can see the results on this Brown Dye page. I’ve also been tweaking existing sections and pages, creating gallery pages and reorganizing sections. You’ll notice this when you look around, as the pages should be easier to navigate. 20 September, 2009. Pysanka site has been republished. It should play well now with Firefox. There may still be some issues with newer versions of Explorer–don't know if this upgrade has taken care of them (one friend noted that reflections on some pages were showing up as duplicate photos and obscuring text in her browser). If you are still having issues, empty the cache, set font size to medium, or try a different browser. Oh, and I’ve added 2009 posters. 18 September, 2009. I’ve been convinced all day that it was the 19th, perhaps because writing 9-19-09 is just numerically satisfying. I’ve been playing around with my new iMac, and testing out some new software on it. Firefox 3.5 plays well with my site–at least those pages I have republished. Firefox 2, while showing galleries, screws up text. It is time to upgrade, and for me to finish republishing all my pages. I will try to do that over the weekend. I’ve uploaded my Ukrainian goddaughter’s pysanky here. Daryna is still a relative beginner, but shows lots of promise. Also, I’ve been updating the history section of the Wikipedia article about pysanky. Now that my software is working, I can update this site, too. 7 September, 2009. I’ve upgraded my software, and am now trying to work the bugs out. If you get error messages, or missing page messages when trying to access my site, please let me know so I can fix them. I suspect I am going to have to re-upload every single page of this site (and there are several hundred) eventually so I can get this new program to work properly. There are some pluses to iWeb 3.1. One is that it lets me create gallery pages like this, instead of having tedious lists of links. I will slowly change most of my “directory” pages to this format, but it will take time. Unfortunately, I’m losing hit counters and “Contact me” buttons here and there, especially on newer pages. If you need to contact me, this should work. 2 September, 2009. It’s been a busy summer, with little time for working on the web site. I spent August in Ukraine, working at a summer camp in the Carpathians. Our campers were children from Ukraine’s many orphanages, and most of the volunteer staff our stipendiaty (graduates from the internaty/orphanages whose further education is being sponsored by American and Ukrainian donors). I taught pysankarstvo. I also visited, after camp, with Ukrainian pysankary (including Vira Manko and Oleh Kirashchuk), comparing notes and enjoying their collections. And I had the opportunity to view (and photograph) several collections of pysanka, both in museums and in private hands. I will post that material, eventually, on this site. I have fixed a few errors, reorganized the Galleries section, added a page, and updated the index. A mere drop in the bucket, but a start. As the days get colder, I hope to add even more. 9 May, 2009. It is so glorious outside this time of year, what with everything blooming. Right now the redbud, cherry trees, apple trees, violets and lilacs are in bloom. The air smells gorgeous! And the lily of the valley is about to bloom. So it’s hard to stay indoors and work on my pysanky or the site, except that it’s been raining so much lately. I’ve updated the section on Children’s books. Have a look. I’ve been working on other sections as well, but still more work to be done. Do check out my new Miscellany section–odds and ends or Pysankiana. And have a look, if you wish, at this poem or at this one. Not on this site, but as part of my Apple MobileMe account, I now have some photo galleries up. They are photos only–no explanatory text–but the files are much larger than here, and are easily downloadable. The galleries also work with Firefox. Have a look here for some high resolution photos of my eggs. 2 May, 2009. Just a few small things. I’ve uploaded the 2009 pysanky here, and added a page of links for pysanka books here. 26 April 2009. Today, the first Sunday after Easter Sunday, is Поминальна Неділя (Pomynal’na Hedilya), a day of remembrances of he dead. Ukrainian families go to the village cemetery where their loved ones and ancestors are buried, and say prayers for he dead. In the previous weeks, the graves will have been visited, winter’s debris removed, and fresh flowers planted. Today we bring offerings of blessed paska and eggs, and light a candle at each grave. The priest goes from grave to grave, chants blessings, swings the censer and sprinkles holy water, and prays for the dead by name. The choir sings «Христос Воскрес» (“Christ is Risen”), sharing the joy of Christ's Resurrection and salvation of mankind with those who came before us. And afterwards we have a picnic. Card tables are set up, folding chairs unfolded, and coolers and bottles brought forth. We drink a toast to the dead, and feast on blessed sausages and cheese, canapes and pickled herring, beet vinaigrette and a winter pea salad, good rye bread and paska. We catch up with friends we haven’t seen in a while, some since last year. Krashanky are left onthe graves, and offering for the dead....and the geese and raccoons. 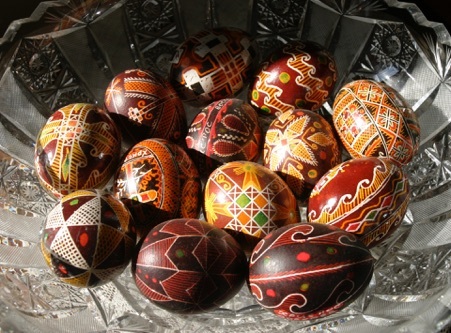 And I’ve left behind traditional pysanky, small ones, with a very simple pattern–the Heavenly Gates. Stars on the top represent heaven, and the gates allow the spirits of our ancestors to travel back and forth, from their world to ours. It is a pagan egg, and a pagan tradition. And I hope my ancestors are watching and approve of our continuing their ancient traditions. P.S. The Dyes section has been worked on, and is much more complete. Have a look. 24 April 2009. There’s lots to do, including lots of new photos to post, and I hope to get around to it soon. This pysanka season I taught three different classes, made about 8 dozen pysanky, and photographed lots more. As soon as I get a chance, I will post it all. I hope to make a lot more white pysanky this year–a traditional, albeit unusual form of the pysanka. The white pysanka on the lower right is copied from the work of Sonia Smyk, and depicts viburnum leaves and berries. The viburnum is also known, in Europe, as the guelder-rose, and, in Ukraine, as the kalyna. I made that particular pysanka for my niece, Kalyna. 27 March 2009. 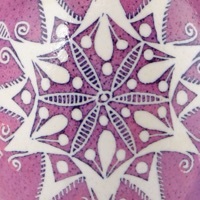 There is lots of new material on this site, as it is the pysanka time of year and I’ve been inspired to write and organize. I’ve had some software issues–iWeb isn’t working on my old main computer properly. It keeps quitting during the upload process, and taking a very long time to save. I’ve placed my files on an external drive and find that everything is working just fine on the fairly new laptop. I suspect it may be time for a new desktop...........three and a half years is a long time between computers. I’ve redone my Pysanka Links, moving them to a new section and breaking them up into a bunch of shorter pages. You can access them from the old page (try the toolbar above). I’ve also added some material to the Brown Eggs section, including sections on working with brown eggs and a series of photos of brown eggs with various final colors. And there’s other stuff as well, and will be more. Have a look around. 5 March 2009. Still jet lagged and still with a lousy cold. Not enough energy to do much besides sit in front of a computer and try and stay awake past 7 pm. I have done a major update of My Modern Pysanky, adding several pages of new photos in the “Phytomorphic” category. Go have a look! It’s really just a first draft, so there may be typos and such. 2 March 2009. I’ve been way in India,and have just returned...with a head cold. So rather than taking down my outdoor Christmas decorations (now that the snow is gone), I am updating my site a bit. Twenty degrees is just too cold to work outside, healthy or not. I taught a pysanka class in India, and will post the results eventually. Meanwhile, I have finished a few additional tutorial pages on emptying, rinsing and draining eggs. Start here and click through the pages. And if you’re the telemarketer I yelled at for waking me up from my cold and jet-lag induced nap, I’m sorry.....but just a little. 3 January 2009. 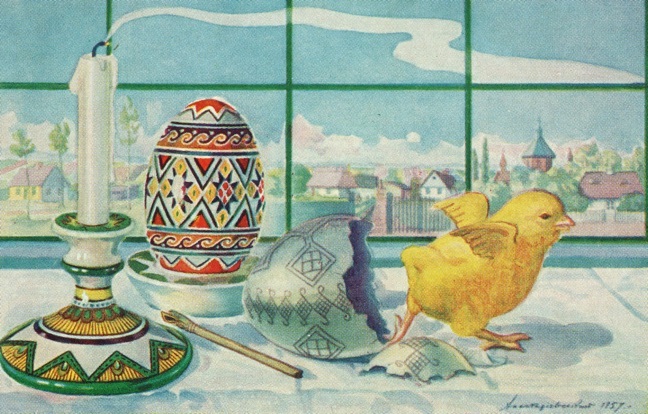 I’ve been updating the Links a bit, and have reorganized the Easter Cards and Pysanka Postcards. And I’ve been catching up on Season 1 of “Murder, She Wrote” (a gift from my sister-in-law) in front of a crackling fire and glittering tree. One needs to enjoy the holidays whilst one can. And real Christmas (Rizdvo) is just around the corner! 28 December 2008. The year is drawing to a close, and I’m a bit happy to see it go. There were high points, but too many disasters to make it a good one. I can’t see much improvement in the near future, and so find it best, like Candide, to perhaps tend to one’s own garden. My literal garden is under snow and ice, but my figurative garden is here, on line. And I’ve been working on it, nothing horribly dramatic, but some interesting additions and general tweaking. I have added a scan of a set of Binyashevsky plates that are out of print and hard to find. 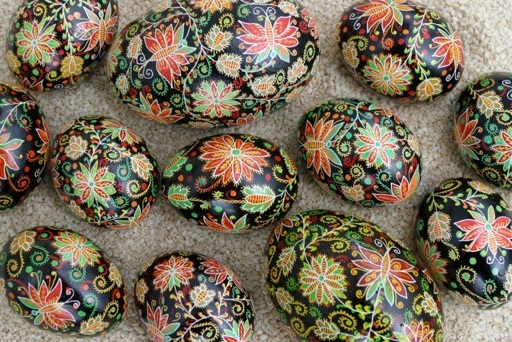 You can view them here, and copy their designs, thus helping to preserve and promulgate traditional pysanka patterns. I’ve also added a few books to the bibliography. I’ve photographed this year’s snowflake pysanky, and those will go up when I finish editing them, something I hope to start on tonight, while I bask in the glow of my Christmas tree. Happy Holidays to all, and hope the new year is not worse than the old one! 15 November 2008. Today is the opening day of deer hunting season in Michigan, which is an unofficial state holiday. Obama won, and the world and I celebrated. My father is recovering quite well from his open heart surgery. (Third time’s the charm!) Kalyna turned 16. 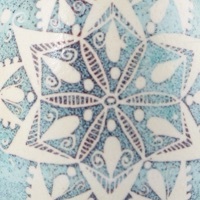 I’ve been teaching Trypillian culture and pottery classes at the Ukrainian school. So much going on lately. More to the pysanka point, I’ve gotten it in my head to do a massive rewrite of the “Pysankarstvo” section of this site. I’ve reorganized it completely, and written a lot of new material. I’ve scrounged up and edited lots of new illustrations, both my photos and random items from the web and my archives. Doing this is not simple. I have to rewrite large sections of the Index as well, change old links and add lots of new ones. It’s a lot of work, and will take some time to finish, but what’s there, although a bit messy at times, is a great improvement on what used to be. Altogether now I have 461 pages on the Pysanka site. A few are duplicates. (I duplicated and moved a few to new locations, but left the originals in place because people may have them bookmarked. I’ve removed their links from most of the toolbars, though.) Many are hidden because they’re not finished or placeholders for future pages. Others are unfinished but on full view. And there are lots of “Under Construction” signs around. So, if you find errors, misspellings or missing links the next few months, don’t mind. They’ll get sorted out soon enough. 14 November 2008. My friend and talented pysanka artist Evan Lewis from New Zealand wrote me today to let me know that his mother had passed away. She had been sick for quite a while, and he had been her caregiver. Your thoughts and prayers will be appreciated. 8 November 2008. I’ve been teaching a Trypillian history class for the kids at our Ukrainian school, which means that I had to learn a lot of Trypillian history. I put together a handout for the kids–it’s written for a ten year old audience–and stuffed it full of interesting illustrations. You can find a l ink to it here. Just a warning: it’s a large file because it’s a pdf with illustrations (many in color). 5 October 2008. I’ve been out of town for a bit, but am back home now. My father had open heart surgery at the Cleveland Clinic, and I stayed with my mother before, during and after the surgery. Everything has gone well and, with luck, he should be coming home soon. 7 September 2008. I’ve added a bunch of books to my annotated bibliography. It’s been interesting, leafing through books I haven’t read in a long time, finding information I’d been looking for elsewhere. After searching he web and posting requests on listserves, I finally found simple, detailed, illustrated instructions for making Pace eggs in a book I already owned! 2 September 2008. I’ve been working on this site, but mostly on non-pysanka pages. However, it’s been long enough, so I finally posted my 2008 collection. Enjoy. 10 July 2008. I’m off to Ukraine in a couple of days, and so won’t be updating the site or quite a while. I hope to have new and interesting pysanka lore to share when I return. Have a lovely summer and/or austral winter. 6 July 2008. Just a few edits and a few new photos. I’ve tidied up my “Posters” section, adding new material from 2008. Have a look at the main Posters page here. 2 July 2008. A small tornado did a lot of damage in my neighborhood and yard last month. Luckily, my house was not damaged, but I did lose a 100 ft tall spruce. There is a lot more sunlight in my yard, which is not necessarily a good thing (although it may cut down on the slugs and snails). I’ve been inspired (no, not by the tornado) to work on a new section of the site – History, Traditions and Legends – which is by no means complete yet, but is coming along. I’ve greatly expanded the information, added a few translations from Voropay, and had to re-jigger the numbering and organization of the site a bit. But here is the new section; I’m still working on finishing the update on history. Some periods of pysanka history are up already; others will follow, perhaps a section at a time. 27 May, 2008. A sudden cold snap means I have a bit of time to work on the site. I’ve pretty much finished updating the “Eternity Bands” section of Symbolism. 24 May, 2008. The gorgeous weather outdoors beckons, and I must heed its call. But first I’ll try and post another set of pysanky to this site. I usually make all of my nieces and nephews (including my cousins’ kids) special pysanky for easter. One year it was chicks, last year they got fishes and butterflies (scroll down to bottom). In 2008 I queried them (or their parents) as to their favorite color combinations, and then made them sorokoklyn pysanky with those colors. You can find them here . 18 May, 2008. Spring is really here–green leaves everywhere. It’s time to try making some lystovanky (Pace eggs). I’ve gotten a few sets of instructions, and now must try them out. 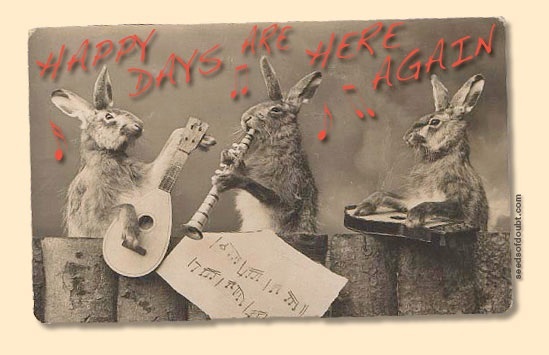 Easter is finally gone, and my Easter card went out. You can download the group photo I sent here. We celebrated the end of the term for Ukrainian school today. I had a lovely display of the kids’ pysanky, as well as examples of traditional and modern ones, information about pysankarstvo, books, and a slide show on the computer. (The latter fascinated several children, who just stood, entranced, staring at the screen for long periods of time). I also photographed all 4 dozen eggs of the kid’s eggs (along with three dozen of mine and two dozen friends’ eggs), and took many more photos of the program (singing, dancing, etc.) today. I will be photo-editing for some time to come. I’ve mostly been tweaking the site, but I’ve written a new page (“Using a Craft Lathe”), and am in the process of writing many more. I will let you know when those are done. 16 April, 2008. Spring has actually arrived, with temperatures in the 70s today. I finally took down my outdoor Christmas decorations (pine roping and lights mostly) and put them away. I filed my tax return yesterday, so now have more time to devote to pysanky. I’ve spent the last two Saturdays leaching pysanky at our Ukrainian school, and have one more session to go. This Saturday I will attempt to teach the drop-pull technique. We’ll se how that goes. Photos of the action and actual eggs to follow. 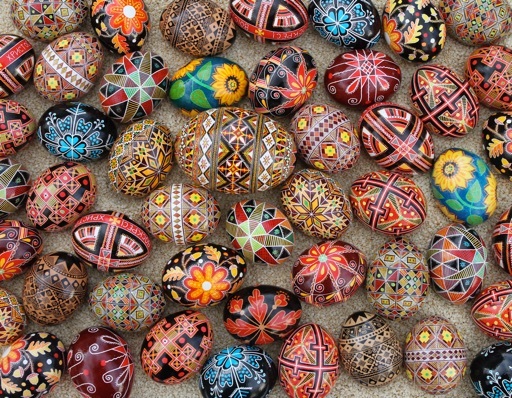 I’ve added photos of the beaded eggs I picked up in Ukraine last autumn. They can be found here. And I finally uploaded the kids’ pysanky from 2007 here. There’s a lot more in various stages of completion, but I’ll let you know when I actually finish. 20 March, 2008. Spring is officially here today, and, as we should have expected, snow is predicted for the next few days. Bad news for those folks in the area who celebrate “Bunny” Easter (as an orthodox friend of mine refers to western Easter) this Sunday. 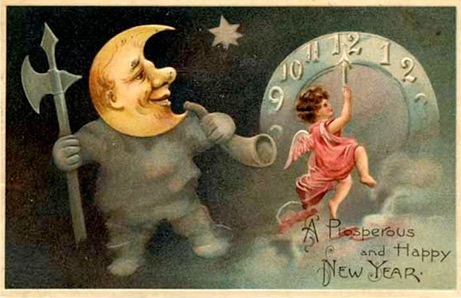 For my pagan friends, it is the vernal equinox, and the new year has begun. Felicitations, and thanks for the sunshine–I really appreciate coming home from work in the light for a change. I have finally begun to work on my pysanky but, since our Easter is not until April 27th, I’m not in a rush.......yet. For those of you interested in my annual Easter Card–it will come in due time. Around the 27th of April, probably. 11 March 2008. Despite having a bad cold (or perhaps because of it), I’ve done some work on the web site. There’s not much else you can do when standing and moving make you woozy, and you can’t get far from the box of Kleenex. I’ve added more step-by-step instructions for pysanka divisions, including completely revamping the sorokoklyn page. More to come soon. I’ve created more figures with Adobe Illustrator, and now have to write the text and lay out the pages. I’ve also added some photos to my “Basic Steps,” with more to come later this spring (depending on when I can get my niece and nephew to pose for me). 9 March 2008. I’ve been playing around with Adobe Illustrator again, and have added a bit to my “Writing Pysanky” section. You can now view all the different pysanka divisions, and some in depth information on a few of them. While digging around in my files, I found some pysanka photos from 2000 (or thereabouts). You can see those here. I also turned up a few more pysanky from Volyn’, giving me a “page 4” in that series. The new high-speed dsl seems to be working like a charm. No hang-ups or failures to load. Happy days are here again! 7 March 2008. I’ve just returned from a month-long sojourn in India. While I did not either gaze at my navel or adjust my chakra, I did get to spend hours working with spreadsheets (analyzing medical outcomes) and had a chance to teach pysanky to a group of 12 year old boys. They really enjoyed the process, but overwhelmed me with their energy and enthusiasm, as well as speed. I’ve tweaked the site a bit, adding little but rearranging a good bit. I’ve also fixed some font problems and typos. I’ve moved more material to the “Writing Pysanky” section, so as to make the information easier to locate. And I’ve added a few more photos from Evan in New Zealand. 24 January 2008. I’ve added a new page for “News from the world of pysanky.” It’s the “NEWS” link above. 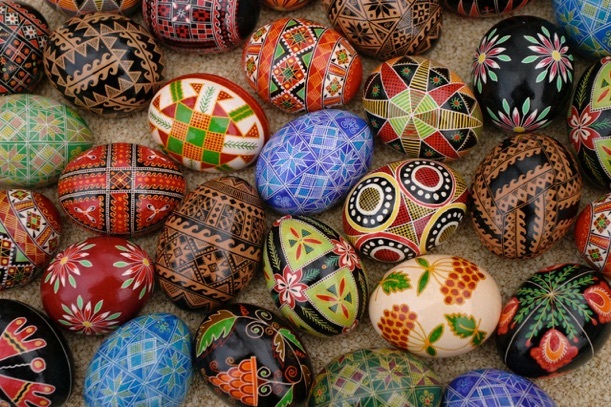 There is going to be a pysanka symposium in Washington, DC on March 8, with workshops and a Ukrainian bazaar on the following day. It sounds interesting! And I’ve added a few more kiwi pysanky (the country, not the bird) by Evan here. 12 January 2008. Rather than doing something useful, I’ve spent time uploading my most recent snowflake pysanky, and reorganizing that section. You can find more background on snowflakes, snowflake pysanka techniques, and a guide to my snowflake galleries at the linked pages. Interesting additions are those of drop-pull snowflakes, and brown egg snowflakes. I’ve been having problems trying to upload this site. I suspect it is because of my crappy dsl service. I am going to upgrade to higher speed service and see if that helps, but it will be a few days before it takes effect. 10 January 2008. I finally re-uploaded my site, which was an eight hour process. I didn’t realize how slow my upload sped was until I really put it to the test. I will have to upgrade soon. Future uploads should be much shorter, as they will be incremental rather than the 4+ GB I think I have. Oddly, although the automatic redirects are working well as promised (this version has dropped the “/iWeb” form all my site addresses), something has decided that the Index page should be the default main page for my site. Until and unless I can figure out how to change that, I have put a small disclaimer at the top of that page. I’ve reconfigured “www.pysanky.info” to redirect to the real main page. The iWeb 2.0 is working nicely. I’ve had no problems saving pages, and no hang-ups on previously normal pages when I upload. It’s made me eager to work on this site again! So far, I’ve re-done the Index, splitting it into several shorter pages. It had gotten too long, and was taking forever to upload. I’ll have to see how that works out. I keep finding odd glitches from the makeover (missing files and huge fonts). If you see any, let me know, and I’ll fix them ASAP. 29 November 2007. Because of continuing problems with uploading the site (it really has gotten quite large), I stopped uploading updates, and I would “lose” a page almost every time, and this would stall the upload, and I would have to sit and watch for the problem page........so I could delete it. It was just too much work for too little benefit. I’ve upgraded to the new version of iWeb (2.0) and, as my .mac account has been upgraded to 30 GB (from the previous 4), I assume that large sites will be easier to work with. I fervently hope so. Once I’ve gone through and corrected at the font errors (link fonts seem to all have increased a size or two), I will start adding new material. Lots of new snowflake pysanky this year...check back in a few weeks to see if they’re here yet. 5 August 2007. I have re-created my Pryashiv pysanky page, and have added a Lemko pysanky page. It’s a regular “drop-pull” lollapalooza! Go have a look. 25 July 2007. Due to some technical difficulties, I’ve lost two pages temporarily. Three of the pages on my site (out of several hundred) became corrupted last week and would not allow the site to load. I managed to find the problem in one page (from the non-pysanka section of my site) and recreate and reload it, but I haven’t figured out the cause of the problem with my two “bad” pysanka pages (India 2006 II and Pryashiv Pysanky). They’ll be down until I can pinpoint the damaged parts and replace them. Meanwhile, I have uploaded some photos from pysanka-making in the UP this past May, and some of my “non-Ukrainian eggs” here. Have a look sometime. 19 July 2007. I’ve completely revamped my “Variations on the Pysanka” section, adding lots of new material, including lots of new photos. I’ve begun to photograph my non-pysanka egg collection, and have begun to make a dent. I now have photos of all of my mother’s wooden eggs, and quite a few of mine. I’ve photographed all the beaded eggs that we own. There is still half a china cabinet to go, but I’m making headway. I’ve added a subsection of “Non-Ukrainian” decorative eggs, many of which I’ve collected during my travels around the globe. They are very incomplete, and here. I’ve added a page bout the pysanka in philately (stamps). Esoteric, but fun. And lastly, I’ve added a Ukrainian pronunciation guide here. 15 July 2007. I’ve put together a step-by-step pictorial guide to making a pysanka, which can be seen here. I’ve also revamped the Variations on a Pysanka section a bit, with a new page about Wooden Pysanky, and I have a lot more of them to add, additions to the ceramic pysanka page (and new text), as well as new text and reinterpretations of the Beaded Pysanka. I had intended to add a lot more photos, but one of my photo lamps is not working, and needs to get fixed/replaced tomorrow. Then I will photograph the wonderful beaded pysanky I bought in Ukraine last summer, and all those wooden pysanky I just borrowed from my mother. 7 July 2007: I’ve finally posted my Easter 2007 collection of pysanky, and have added several more posters. I’ve also updated a variety of pages, including adding this year’s pysanky to the appropriate pages (Trypillian, birds, etc.) and making the Drop-Pull section more accurate and up-to-date. 6 July 2007: The Sorokoklyn or “40 Triangle” section has been completely revamped, with lots of new photos and much new text. I’ve added lot of traditional sorokoklyn pysanky (and “almost” traditional ones), a recent interest of mine. Now I need to get some things done around the house – those plants don’t water themselves! 5 July 2007: I’ve uploaded the star-design brown egg pysanky I made in 2007, and have begun uploading more traditional pysanky. A set of Lemko drop-pull pysanky from the Pryashiv region of Slovakia are now on line here, along with some ethnographic information. I’ve also tweaked my Regional pysanky page and a few others. 1 July 2007: A friend sent me some more Easter cards, both modern and traditional, and I’ve added them to my collection. There are some really nice images in the “Traditions” section, and I’ve added a new section, “Modern” Easter cards. 29 June 2007: My annotated bibliography is now on-line. I’ve added a new “Books” section, with information about, and photos and reviews of my many books about pysanky and related topics. Many of the books here are my sources for this web site. Have a peek. If you wish to add your review of any of the books, you can e-mail ti to me via the link on the page. Also, some tweaking of the “Regional Pysanky” section, as I learn more and more each day about Ukrainian ethnographic regions. If only I could find one map that has them all........and transliterated! 28 June 2007: I have bought a domain name, so you can now access this site simply by typing “pysanky.info” into your browser (full address http://www.pysanky.info ). It beats having to type in http://web.mac.com/lubap/iWeb/PYSANKY/ any day, and is much easier to remember! 3 June 2007: 22 Easter cards (my 2007 collection) have been added to the Easter card section, to all four categories. There are more religious cards than usual, and also one American card with “lystovanky,” also known as “Pace” eggs. The new cards have mostly been added to the end of each section, except on the “traditions” page. I’ve added more details from a few previous year’s cards, and lots of details for this year’s cards.